I used Redken years ago when I was child and absolutely hated it. Back then, Redken would dry my hair out and make it brittle. Definitely not moisturizing. However, over the past couple of years I've been trying several of the small bottles sold at Ulta and now I'm loving Redken! So far I have used Satinwear 02 (ultimate blow-dry lotion), Outshine 01 (anti-frizz polishing milk), Smooth Down Heat Glide (protective smoother) and I find that I can't live with out any of these! I really do use these everyday depending on if I straighten or curl my hair. I have also tried the Redken Clear Moisture shampoo and conditioner, which is supposed to give lightweight moisture to normal/dry hair, and loved that one too! Mind you, living in the desert heat of Vegas zaps a lot of moisture out of your hair, but Clear Moisture kept my hair soft and smooth! 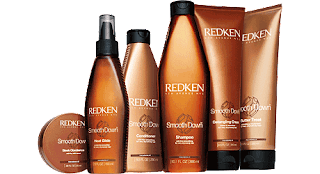 So I decided to give Redken Smooth Down shampoo and conditioner a shot- I purchased the gigantic bottles too- that's a commitment! The verdict: I LOVE IT! It really keeps my hair soft, smooth....shiny too! Frizzies are down to a minimum. Now that's what I like to see. The price isn't bad either - Ulta has this great in-store sale going on for $15.99 a bottle (33.8 FL OZ). The sales girl says it will go on til the end of July.